I took a road trip to New Mexico over the Thanksgiving break and reeled off about 3500 pics in 4 days. They are whittled down now to keepers and I'll post some series over the next few days or weeks. 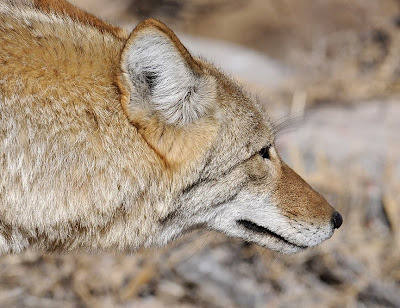 A primary location of my photo phrenzy was Bosque del Apache NWR. While most famous for its wintering Sandhill Cranes and geese, I've always enjoyed the other birds and wildlife that can be seen along the tour loops and trails in the refuge. One morning, as my dad & I began slowly perusing the Marsh Loop I spotted a Greater Roadrunner basking in the early morning sun. Overnight temps had dropped to below 20 degrees F, so the bright sun must have felt good on those dark exposed body feathers. 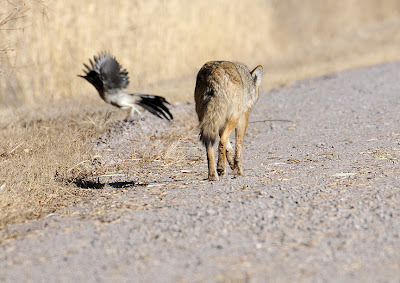 I've seen roadrunners do this before so I know it isn't a behavioral fluke. The roadrunner alternated bouts of basking with a slow patrol that brought it ever closer until it passed right alongside the car- too close to fit the bird any more, I then opted for head shots. 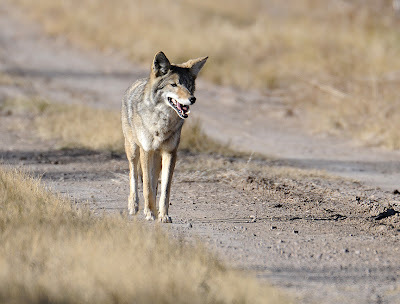 A bit later, I saw a coyote loping up the road from behind us. 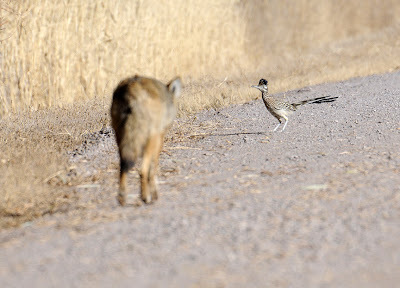 It kept coming, with pauses to sniff and look along the road's edge, until like the roadrunner it passed right alongside our stopped vehicle. Needless to say, my shutter was snapping. Head shot opportunities again when it was too close for anything else. Vehicles can be really good photo blinds, especially in areas like the Bosque where wildlife is used to seeing them and doesn't much care so long as you stay inside. As the coyote continued down the road away from us I realized that there was another roadrunner farther along crossing the road. 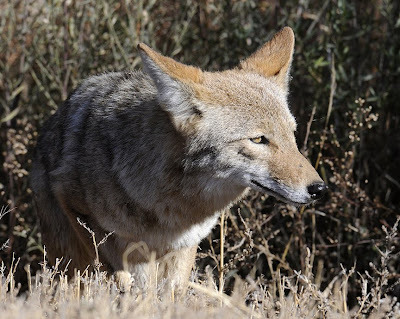 When it saw the coyote coming it stopped to watch alertly. I immediately thought of my childhood favorite Roadrunner cartoons. 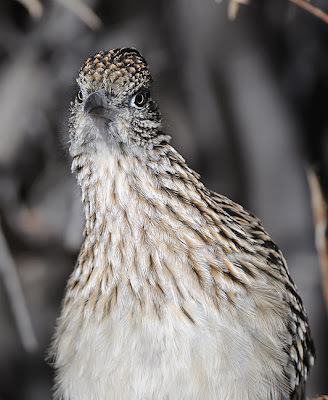 Sure enough, the roadrunner emerged victorious in this encounter, just like in the cartoons. Unlike the cartoons, though, the yodel-dog didn't get smashed by a steamroller, rock, or oncoming train, nor blown up by his own booby trap. He didn't plunge into a dusty crater in a gorge or smack into a picture of a tunnel he had painted on a canyon wall just after the roadrunner ran right through it. Instead, it just kept loping along in a fluid gait, looking and sniffing for prey just as intently as any birder along the tour loop would inspect the willows, ponds, and marshes. Well done. I've never been down there even though I lived in Springerville, AZ for 6 years. I look forward to more of your adventures. Groovy. I look forward to additional posts from your recent trip. I was going to go to BdA yesterday, but it was too cold and stormy. I'll go another time TBD. That's great! And not an ACME sign anywhere. You saw the real show, and the pics are great. What? No anvils? Nice photos! Neat post! What a fun thing to witness. Great shots, Bill. 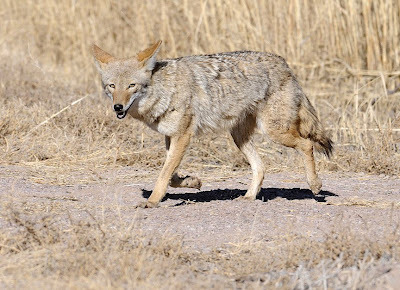 I was there during the festival and also saw one of the coyotes loping along a trail, while on one of the bus tours. 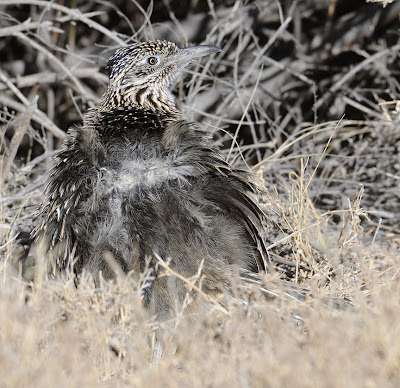 I also saw a couple of roadrunners at separate times no where near any of the coyotes. Maybe you could leave some rocket roller skates in a box beside the road? Very entertaining, must have been a good drive. Terrific encounter and photos. 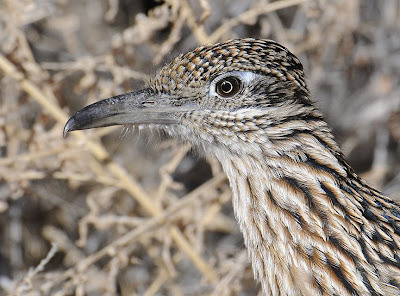 I gotta go photograph me some roadrunners! (and will be happy with shots 1/2 as good as yours). I just found this post - what a great experience. I visited Bosque earlier this year, in January. 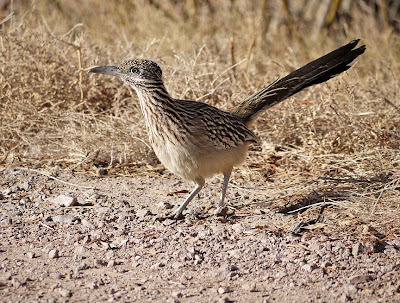 I even captured some photos of what could be the very same roadrunner - but never saw a coyote. How very cool!